Today, We enter the medios, and recall one of Lamborghini’s better efforts. Automotive exotica are not what they were. Traditionally selfish devices, aimed at those who preferred to enjoy their pleasures in isolated splendour. Hence the requirement for additional perches not being terribly high on the exotic carmakers’ priority list. However, a gap in any market simply begs to be filled and Ferruccio Lamborghini was not an individual to ignore a potentially lucrative opportunity. By the mid-60s, Lamborghini was offering, in addition to its well regarded two-plus-two 400 GT, the groundbreaking Miura, which brought mid-engined racing car thrills to the autostradae. But while Ferruccio’s rivals offered full four-seater machines, Sant’Agata at this time did not. Tasked to address this deficiency, carrozzeria Bertone was commissioned to create a Berlinetta which could seat four in comfort, while offering the visual and one assumes, visceral excitements of the Miura, while embarrassing their Modenese rivals by way of bonus. The result was 1967’s Marzal. Using a lengthened Miura chassis and retaining its transverse mid-engined drivetrain, the Marzal employed a 2.0 litre, slant-six version of the existing 4.0 litre Lamborghini V12. Clothing this mechanical package was a body of exceptional proportion, dazzling audacity and daring modernity. The work of Marcello Gandini at his creative peak, the Marzal looked like nothing on earth with its huge, almost fully glazed gullwing doors, unusual volumes and striking hexagonal graphics. The car was a show sensation and while Bertone was allegedly keen to build it, Lamborghini wanted it toned down. Fortunately for Nuccio Bertone, Gandini had been busy. That same year, following a design competition sponsored by the UK’s Telegraph newspaper, Gandini reclothed an E-Type Jaguar with a radical new body. Called the Pirana, it received its motor show debut at London’s Earls Court in 1967, to considerable acclaim. It rather inevitably found its way to Browns Lane where its presence is believed to have impacted upon studies being carried out for a replacement to the long running E-Type. This car, dubbed internally as XJ21 stumbled and ultimately fell victim to project drift and the politics of the BLMC takeover. With Ferruccio cooling his feet and Jaguar shuffling theirs, Bertone had Gandini combine both concepts, the resultant car being to a greater extent, a enlarged version of the Pirana concept coupled with the interior package of the Marzal. Lauched in 1968 as the Espada, it was the first genuine four-seater to carry the fighting bull of Bologna, offering the (very) well heeled the accommodation of a saloon with the romance of a Grand Turismo. 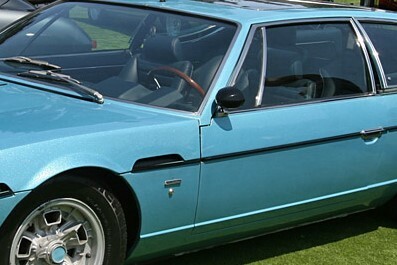 Sadly the Espada, named after a type of sharply pointed sword employed by Spanish toreros, lost a good deal of the Marzal’s almost delicate appeal in translation, acquiring by necessity of its front-engine package, a taller bonnetline (albeit less so than that of the Pirana) and a blunter, more brutish demeanour. Very much a packaging car, the Espada was as much about the interior, which in launch specification, was more about flamboyance than practicality – a matter which would be remedied in successively more practical if less flamboyant fashion in later iterations. The car’s packaging also dictated the external volumes, which lent the admittedly visually striking and appealing shape a rather jolie laide appearance from certain angles. Gandini was at the time, a master of disruption and visual surprise and certainly until the decline of his powers towards the latter 1970s, his unconventional, at times confrontational flourishes were thrillingly new. 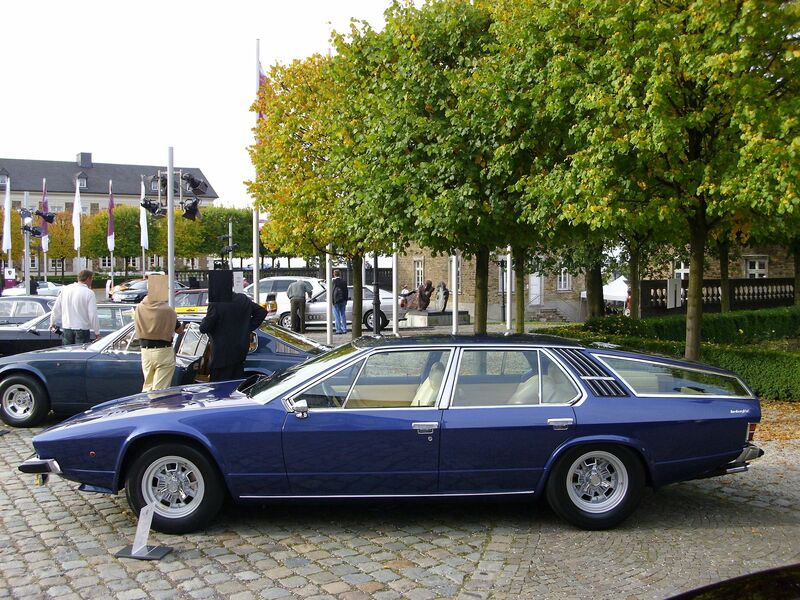 However, the production Espada appeared clumsy in places – in particular the unhappily insubstantial junction of A-pillar, clamshell bonnet and door. The rear three quarters were by necessity perhaps, rather bulky and inelegant (a matter shared with the Pirana), and as with so many Gandini designs, the rear end appeared under-resolved, although the treatment would be reprised with greater success for the 1974 Maserati Khamsin. Its styling deficiencies however proved little impediment to success, with over 1,227 cars built over a ten-year period over three distinct series. Perhaps the most usable Lamborghini of its era, and certainly the most commodious, the Espada concept died with it in 1978, with Sant’Agata lurching from disaster to crisis, forced to eke out a living on the back of the evergreen Countach until the advent of better fortunes. A decade ago, Lamborghini’s current owners debuted the Estoque, a four-door, four seater concept, believed to have been evaluated for production. Stillborn owing to an insufficient business case, Sant ‘Agata, like everybody else it seems, elected to turn away from its heritage. Somewhat ironic would you not agree, that the path of least resistance is embodied in the repellent Urus ‘off-road’ SUV? Lamborghini has always seen itself as an outsider, a disruptor if you will, but while cars like the Espada offered genuine surprise and no little delight, today’s Bolognese offerings by contrast offer no surprise whatsoever. But while we might find today’s Urus offensive, is it not as accurate a reflection of its customer base, as that of the Espada? Fifty years on, exotic cars may not be what they were, but they remain wholly selfish devices. ©Driven to Write. All rights reserved. Good morning Eóin. Yes, the base of the A-pillar is a surprising defect. For me, though, the (I assume) vents on the front wing either side of the wheel arch are far more disruptive to the elegance of the design. Were they really necessary to provide sufficient engine cooling? Shame. A bit heavy handed on the chromework, but I still like it, a lot! If you’re going to disect a design element like the A-pillar debacle you need detail pics for an article like this, because I have never noticed anything wrong with that aspect before, and I need clarity to understand the question at hand. Where’s Kris Kubrick when you need him? I’m constantly amazed of the quality of the pics from Autodidakt, that’s the way to do it. I understand there’s no budget for a photo op with all the whiskey bills for Archie Vicar still haunting the accountants thirty years after the fact, but a simple google search will do. If you have never seen Davide Cironi I can highly recommend him on YouTube, he really is the epitome of a passioned Italian auto journalist and Alfisti. And he has made some interviews with people like Paolo Stanzani, Romano Artioli, and in this little clip an interview with the very hard to get Marcello Gandini at his home. That is Stanzani talking with love and affection about Gandini in the intriduction. And there are English subtitles. Enjoy! Would that we had the massive resources and legions of creatives afforded by our Hamburg-based cohort, but with cloth being stretched gossamer-thin around these parts, we must make do as best we can. On behalf of DTW, I can only apologise for failing to meet expectations. Apology accepted, and the provided pic will indeed suffice. But yes, that is indeed a very weird solution to the problem, and I would vett much want to know what the problem was to require such a solution, because there must have been some kind of technical problem. Too much tumblehome which would make the corner of the door scratch something when opened? It could also be a complete folly by Gandini without any technical problem to visually anchor the A-pillar into the body. A great write up Eóin. The Espada is a handsome car, but is very rooted in the Sixties in style. The Marzal is something else entirely; what a shame it never saw production in that form, simply stunning. It’s really difficult to place the Marzal chronologically; in photos I’ve seen alongside an Espada it could be 15 to 20 years younger. Even more rooted in the Sixties was the Islero of the same year, basically a (rather suave) rebody of the old 400 GT. But yes, the Marzal was a terrific looking thing – one of Gandini’s finest. The Espada suffered from being more Pirana than Marzal, which in my view was the wrong choice, since (again my view), the Pirana was a rather ungainly looking device which if anything, simply demonstrated that the E-Type’s proportions were a lot harder to clothe than one might have thought. The shape certainly benefitted from an increase in wheelbase – ironic really, since the Pirana was already based on the 2+2 E-Type shell. The Espada is one of those cars that I think does not photograph that well, but it looks really imposing in the flesh. Little design details I can forgive, given its overall impact. I have fond memories of being offered a ride in one in exchange for some Italian translation of two manuals – the two of them both disagreed with what the label in the engine bay depicted. The ride included being driven up a steep hill, full noise, windows down! Opera has never sounded so good. Comfortable, spacious, and hatchback to boot. It’s got a place reserved in my fantasy garage. Pleasantly bonkers. “Espada” means simply “Sword” in Spanish. The dedicated sword used in bullfighting is called “Estoque”.